Daniel Buren, “Excentrique(s), travail in situ,” 2012. Détail. This May and June, Daniel Buren takes over Paris’s Grand Palais with his Excentrique(s), travail in situ for Monumenta. The annual exhibition – which was started in 2007 and has in the past featured artists like Anish Kapoor, Richard Serra and Christian Boltanski – gives over the massive space (13500 square meters, to be precise) of the Grand Palais to the display of one artwork by one artist. As of May 2012, that artist is Buren, who, instead of adding his own stripes, has appropriated some of the existing ones through the use of a canopy of multiple, mounted colored lenses. 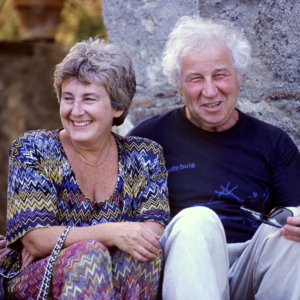 Last week it was announced that husband-and-wife artists Ilya and Emilia Kabakov have been selected for Monumenta 2013. While partially known for intimate, illustrated albums and whimsical sketches, the duo are no strangers to working with scale, having completed enormous installations including The Ship of Tolerance in Venice, The Red Wagon in Dusseldorf and Moscow, and The Palace of Projects for the Public Art Fund in New York. Those who have followed their creative efforts should not be surprised to hear the theme they have chosen for Monumenta 2013: Utopia. This entry was posted in Uncategorized and tagged Daniel Buren, Ilya and Emilia Kabakov, Kabakov, Monumenta. Bookmark the permalink.